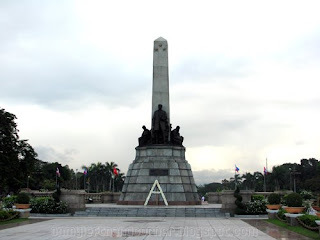 This is the monument of Dr. Jose Rizal, the Philippine national hero. It is also more popularly known as the Luneta Park in Manila. It marks the spot where Rizal was executed with a firing squad. I've been passing by this landmark since I was a little girl but I only got a chance to actually go down the car and explore the area last November 2008. It was incidental that the marathon I joined was held in Roxas Boulevard. The monument is in memory of the late hero. The park teems with joggers, lovers, and various vendors. Many groups converge here for their daily stretching and tai-chi exercises, or to catch the sunrise along Manila Bay. As they pass by this monument, I hope they are also reminded of Rizal's non-violent means of trying to make a change.